Hi. My name is Wendy Bradley and I’m a writer… and it took me several years of therapy to be able to write that. But why should it be such a big step to call yourself “a writer”? Does the thought of it make you clench your neck muscles and your voice come out strange? I think I can help you with that! I’ve been developing ways of tricking my subconscious out of that mindset. You know, that one where you go: “ooh, I’m Writing! No, not that word. No, not that one either. No, none of those words are any good. No, you need to write a perfect first sentence before you write a second sentence. No that’s not perfect either. No. Nope. No.” Recognise the feeling? Well be a Sunday Writer instead. Sunday writers just do a bit of typing, odds and ends, when they feel like it. Sunday Writers can write a bad sentence and still feel proud that they’ve written a baaaaaad sentence – at least it has words, some of them in the right order! 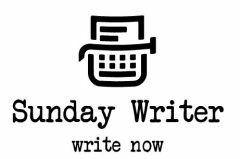 Sunday Writers get words down: we can fix them later if we have to.